Rare Storm Forms in Atlantic; Will it Impact New England? The Atlantic hurricane season doesn’t officially begin until June 1, but "Arlene" didn’t want to wait that long. 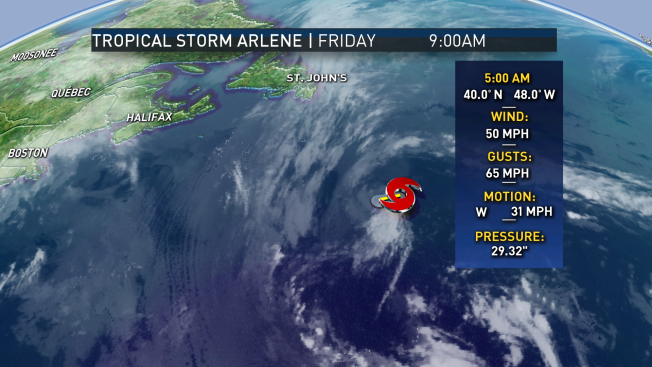 An area of low pressure in the middle of the Atlantic Ocean developed into Tropical Storm Arlene late Thursday afternoon. By Friday morning, the storm was racing westward away from the Azores across open ocean. Winds were sustained at 50 mph near the center. The storm will be absorbed into a different, non-tropical storm during the day on Friday. It will have no impact on land as that happens. Tropical storm formation in April is rare, but not unprecedented. Since roughly the 1970s, when widespread satellite usage began, just one other tropical storm formed in April. Prior to the launch of satellite storms like Arlene, away from land and in the middle of the ocean, likely went unnoticed. The next named storm in the Atlantic will be called Bret.